And so begins a new era at NYCTaper. Our Bandcamp Page! We’ve watched Bandcamp grow from a small site to literally the number one place where we buy our music these days. As we have consistently maintained at NYCTaper, our site exists for the betterment of the artists who we feature. The site has always maintained that our readers’ support of the artists should follow naturally from exposure to the live music available for free from this site. 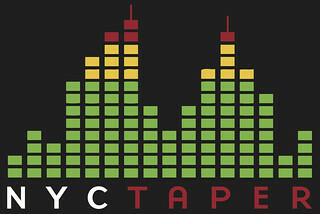 While we are certain that our site has helped artists and we know of many occasions where readers have been introduced to new artists and have gone on to purchase official product, attended shows, and in some cases become rabid fans — there’s never been a metric where we could measure the direct positive effect of NYCTaper on a band’s career. That begins now. Firstly, let me say unequivocally that NYCTaper is a non-commercial and non-profit site. Any revenues generated by our Bandcamp page will go directly to the artists (minus Bandcamp and paypal fees). Secondly, all of our downloads offered through Bandcamp will come on a Pay-As-You-Want basis — i.e. we still offer “free” downloads (in multiple formats) and streaming but we would hope that our readers would not abuse that privilege. Support the artists! Finally, the Bandcamp platform is a superb web application and its mobile capabilities will make us more accessible and friendly to our readers. The Bandcamp download will only be included in a post where the artist specifically agrees to this arrangement. We assume that not every artist who agrees to be on NYCTaper will also agree to this type of “official” release. Much of this site will remain exactly the same. In terms of our archives, we will offer any artist who has previously been on this site the opportunity for us to move their live recording to our Bandcamp page as a Pay-As-You-Want download. Tomorrow will appear the first recording of this era. We can’t wait!